As a child, Costa Rican artist Milo Gonzalez always showed skill in drawing and illustrations, but chose other courses of study in secondary school, and later had some formal studies as well as numerous tutorages, including one from Master Kan Yu Chen from La Casa del Artista. Studying Chinese art brought a new dimension to Milo's technique with a different conception of art and beauty. Gonzalez tells us his focus is that every work he creates contains new techniques and composition, with the topic being secondary. He searches for aesthetic values and strives to avoid sterile repetition. 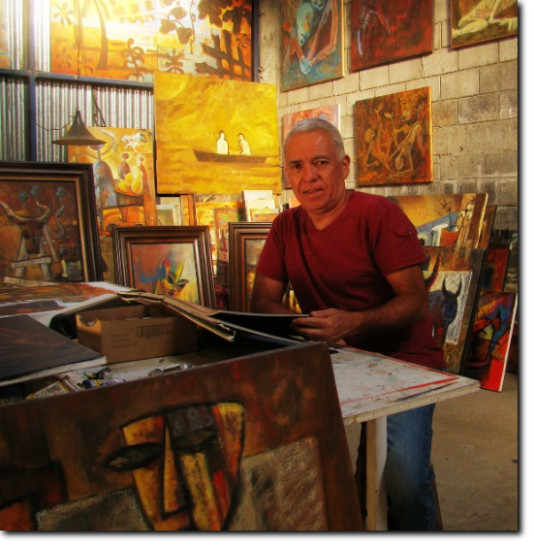 Gonzalez has participated in numerous solo and collective expositions in Central America, and the U.S., including a solo exhibit at ArtExpo Miami 2012. Read more about Milo in his one-on-one interview with Tico Times' Amanda Zuniga. Read more about Milo in A.M. Costa Rica. Watch the slide show from Milo's exhibit opening here.